Recent initiatives for lean, just-in-time manufacturing within the automotive industry have emphasized the need to find faster and more efficient heating technologies. Induction heating machines are used in the manufacture of many parts along the automotive drive train - including CV joints, tulips, gears, steering racks, and wheel hubs. Induction technology is also used to produce large body and engine parts such as rocker arms, cam shafts, valves, connecting rods, banding, crank shafts, and starting rings. Finally, shock absorber components are hardened and formed using induction. Plant managers who must comply with advanced environmental regulations have discovered that they can reduce their emissions and lower their utility bills by replacing an old fossil fuel furnace or flame heating setup with a clean, fast, and efficient induction heating machine. Bonding - Components of automotive assemblies such as doors, bonnets, liftgates, decklids, fenders, and roof panels can be bonded together by heating structural adhesive material that has been previously applied. Hardening - One of the advantages of induction heating is that it can be directed to specific areas of the part with great accuracy. 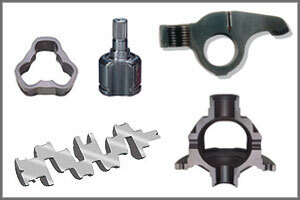 Most hardening operations treat the outer part surface. The treatment can be done in two different ways: either static or progressive (by scanning). Tempering - While traditional tempering systems heating the parts at relatively low temperatures (from 150 to 700ºC) for a relatively long heat and cooling cycle, induction tempering permits the use of higher temperatures and shorter heating/cooling cycles. Annealing - In contrast to hardening, the annealing process involves a relatively slow heating step followed by gradual cooling. Annealing is used when the material must be softened as much as possible; tempering softens the metal but not to the full extent possible. Brazing - An induction brazing machine quickly delivers highly localized heat to minimize part warpage and distortion. Brazing in a controlled vacuum or in an inert protective atmosphere can significantly improve overall part quality and eliminate costly part cleaning procedures. 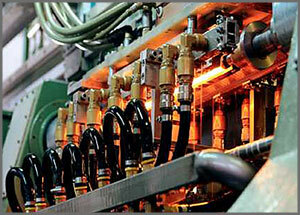 Induction heating machines are used to manufacture a wide range of automotive parts. Hardening automotive drive shafts with induction heating.